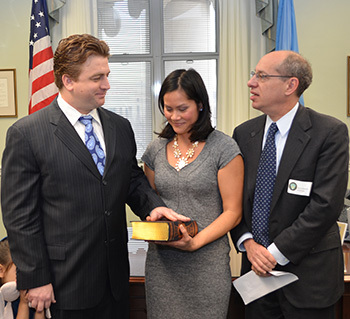 Joshua Wright has left a mark during his tenure as an FTC Commissioner. The reason is not a secret to anyone. I do not always agree with his positions, but his contributions are invariably relevant and thoughtful. If he has written on a topic on which I am working, I always end up reading his stuff, and I always get something out of it. My favourite pieces are probably his speech on incomplete contracts, standard-setting organisations and FRAND and his article (co-authored with Douglas Ginsburg) on dynamic analysis and the limits of antitrust. When I think of Joshua Wright, the first image that comes to mind is not that of the FTC Commissioner, however. I tend to think instead of a young Assistant Professor presenting a paper. Back in January 2009, I was at Stanford Law School. It was the last of the six wonderful months I spent in Palo Alto as a visiting PhD student. Mitchell Polinsky was kind enough to allow me to attend the Law and Economics Workshop, where Joshua Wright presented ‘Is Antitrust too Complicated for Generalist Judges’, which was eventually published in the Journal of Law and Economics. There was the Assistant Professor defending his findings in front of the mighty Stanford Law Faculty. That seminar made a strong impression on me. The substance of the paper matters less than the atmosphere and the attitude of the participants. It was a really intense seminar. I remember the probing questions, which revealed that everybody in the room took very seriously the task of advancing knowledge. To this day, I still think about the seminar as the ideal academic environment, in which nothing is personal and there is no room for pettiness. What matters is to get things right. No matter how demanding, I am sure Joshua Wright felt grateful for the session. With these vivid memories fresh in my mind, you can imagine how impressed I was when I learnt that, a mere four years later, Joshua Wright had been sworn in as a Commissioner. This amazing career is testimony to his talents and energy, which have become even more apparent during his time at the FTC. If it was not clear enough from the above, I will finish by saying that I am delighted that he is returning to a full-time academic position.